I mentioned that yesterday was filled with driving and soccer. During our final game, I overheard some of the parents talking about our proximity to The Ice Cream Man, located in Greenwich, and my ears perked up. I knew that The Profussor and friends had recently toured some of the best-known area spots for homemade hard ice cream as reported on The Fussy Little Blog and The Ice Cream Man had emerged as the clear winner. 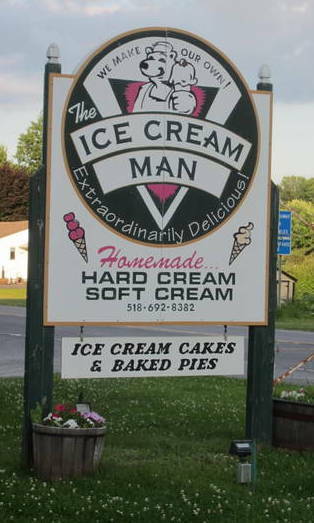 The Ice Cream Man is about an hour away from our house near Schenectady, and no one in our family had ever eaten there, so we felt strongly, in spite of our weariness, that The Universe wanted us to drive slightly out of our way home and give it a try. Tragically, there was no mint chocolate chip. This is M’s and my go-to flavor, and they didn’t have anything minty available. 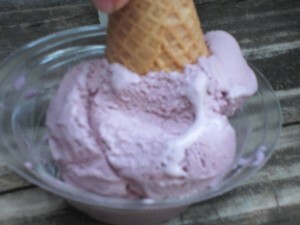 The Ice Cream Man has several basic flavors that are always available as well as rotating flavors of the day. I settled on Hugh’s Chocolate Overload, except that while I was waiting to order, Cute W ordered it! So I switched to Brown Brownie, because of course we taste each other’s food and share. Brown Brownie was chocolate with brownies, while Hugh’s Chocolate Overload was a darker chocolate with fudge and chips, I believe. I was overtired then and I’m overtired now, but basically, it was chocolate and chocolate in chocolate. The Brown Brownie was milder and more cocoa-y, while Hugh’s felt richer and almost syrupy. In yet another gorgeous delight that is our marriage, Cute W and I each decided we preferred the other person’s choice, and we happily swapped. He’s so dreamy. When we arrived there was a long line at the outside window, but while we were waiting, J had to run into the bathroom, and inside we discovered that we were welcome to order at the counter in the otherwise-deserted indoor section. It looks empty just because it was so lovely outside that everyone was outdoors. M had chocolate ice cream–she was a bit stumped because she’s always, always a mint chocolate chip girl–and M had some yummy black raspberry. She was barely out the door before her ice cream toppled onto the ground. They replaced it for free, but we made her turn it upside-down into a cup for fear she’d lose it again. In fact, I always ask for a cup as a policy, but J got ahead of us trailing our friends while Cute W and I were still waiting for our cones. 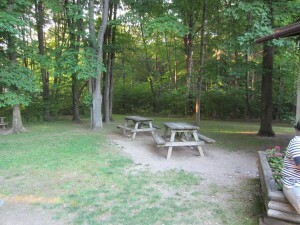 Outside it was wooded and pleasant with several picnic tables (more than this, it’s just that I avoid taking pictures of strangers because then they assume that I’m a freakish stalker type). So, should you make the drive? Well, that depends on you. 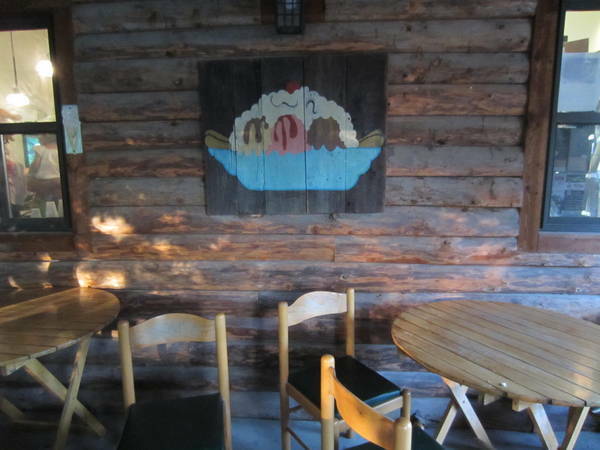 If you appreciate locally-made food and are a discerning ice cream eater, you must go. If you’re taking out-of-towners out to dinner in Saratoga Springs and thought about Ben & Jerry’s, you might want to go for this slightly more out-of-the-way but picturesque, local-color option. Frankly, I’m not much of a discerning ice cream eater, and I hate to drive. But next time we’re playing that soccer team, I’m in. In fact, maybe I can plan ahead and request mint chocolate chip ahead of time. . . . I <3 the ice cream man, with a small amount of bias stemming from hometown pride. It's really just freaking phenomenal ice cream. There is, I am pretty sure, sometimes a minty option … with brownie bits? Minty is not my personal fav, but my friend Krys loves it. Also, seasonally, they make Hand Melon flavor that is supposed to be awesome and made from the melons grown right around the corner (also totally worth the trip!). Great berry picking there, too! And as an added bonus: there is a letterbox hidden on the property – that is how we discovered the Ice Cream Man the first time! @Sara, yes it was super-yummy. @Michelle, I’ll keep my eye out for mint. @Everyone, just looked this over in the morning and there were So. Many. Typos. Sorry for the poor quality control. My schedule’s been nutty lately. Okay – I’m just going to say that whoever ate at Snowman really needs to try again. 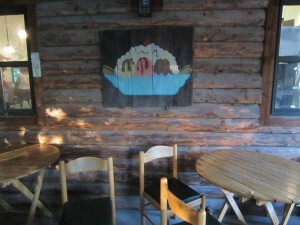 It is, without a doubt, my favorite ice cream place is in the capital region. Along with many others since the line on a Sunday night is generally more than 30 people and wraps around the corner. And we’ve made converts of our good friends, who now join us on our Sunday night ice cream adventures. It’s also listed in the “Explore” magazine as the #1 summer thing to do in the capital district – not just ice cream thing. Sorry if that’s coming off a little harsh. I’m feeling a little sleep-deprived and a little cranky today. @Erin, sounds like you need to take this up with the Profussor. . . .